Value changes the look of the Ohio Star block. 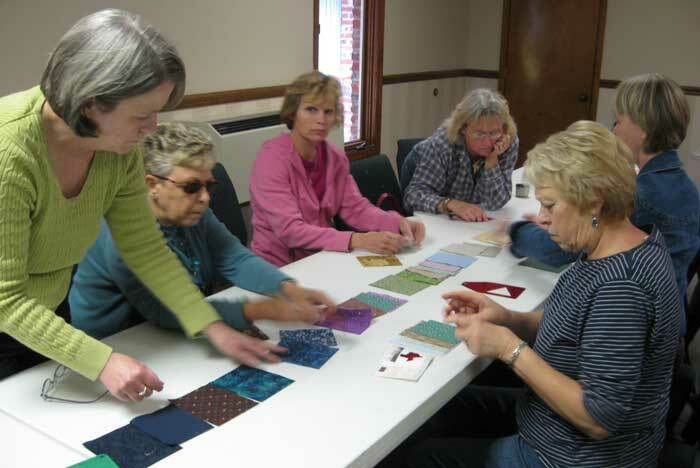 The Choo Choo Quilters program that I presented on "Identifying Value in Color" was a blast! 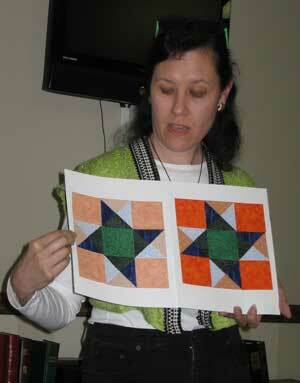 One of the members had a scrappy quilt top using the 1000 triangles design for Show and Tell. I couldn't have asked for a more perfect segue into the program. It's easy to identify value—the lightness or darkness of a color—with paint... you just keep adding drops of black paint to pure white and you can the whole grayscale. In fabrics, with their various prints, patterns and multi-colored motifs, it can be a little more difficult. Using the wrong side of the fabric to change value. 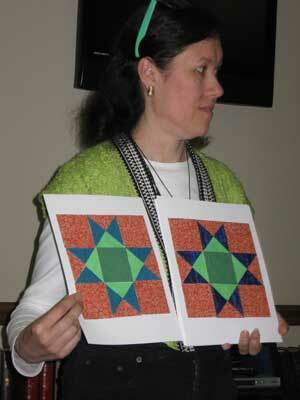 I took a classic, identifiable quilt block—the Ohio Star—and manipulated the placement of value to change the emphasis. Color placement remained the same: orange background, blue star points and green in the center. See how different the blocks look when the value (not the color) is changed? Here is an example (right) of using the same fabrics, but using the back side of the orange fabrics to change the value. Remember, when you buy fabrics, you pay for both sides. So, if you need a lighter shade or tint of a color, try flipping the fabric over. The class exercise was lively and interesting. 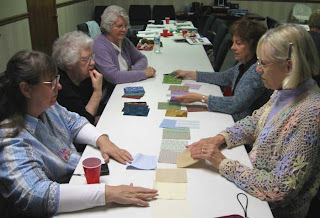 I requested that attendees bring light, medium and dark fabric swatches to the meeting. 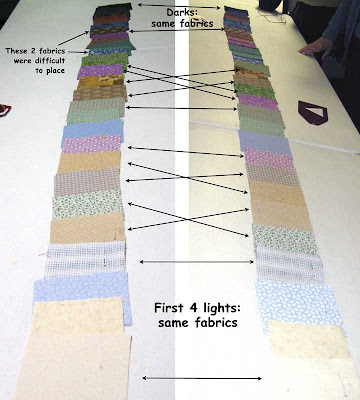 The group was split into two teams and each team arranged the same group of fabrics by value from light to dark. Several guild members used different techniques and devices to aid in identifying the values: wearing sunglasses, squinting, looking through peep holes, camera viewfinders and value finders. At one point, we even turned off the lights. Playing with fabrics in the dark... what fun! The Results: Below is a comparison of the team results. Both groups identified the same fabrics in the lightest, darkest and medium categories. The "transition" fabrics (from light into medium and medium into dark) were a little less consistent. Two of the fabrics with large motifs were more difficult to place in the sequence. One had white flowers on a navy background and the other had tan motifs on a dark brown background. It's also interesting to see that the light blue fabric (3rd from the bottom) is in the same location in both groups even though the group on the left has turned this fabric to the wrong side. Hmmm... wonder what that's all about?? Try this exercise using your own fabric or yarn stash. Are there any gaps in your stash's value range?